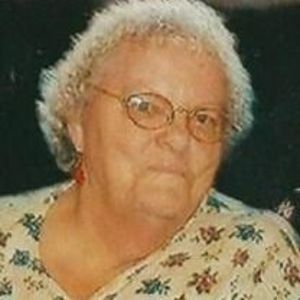 Martha Ann Griffin, 79 passed away Wednesday March 11, 2015. She was born on October 28, 1935, in Johnston County to the late Jesse Wade Johnson and Mamie Capps Johnson. She was also preceded in death by her husband Charlie Griffin Jr. and a son Martin Wayne Griffin Sr.
Martha was a loving and caring mother, wife, and grandmother.. She was loved by many. She was a member of Proctor's Chapel Baptist Church. She leaves to cherish her memory her four daughters, Gail Taylor and Husband Ronny of Elm City, Virginia Lewis and Husband Ronnie of Lucama, Patricia Griffin of Rocky Mount, Amanda Griffin of Sharpsburg and one son Robert Griffin of Sharpsburg. Eight Grandchildren, Candy Blake and Husband Sandy, (Little) Ronny Taylor and Wife Wendy, Martin Wayne Griffin Jr., James (Peanut) Williams, April Condia and Husband Steve, Pamela Bennett and Husband Steve, Nichole Griffin and Taylor Griffin. She also leaves to cherish her memory 11 Great Grandchildren. There are many friends that will cherish her loving memory and the special way that she loved them individually. She was always loving, sharing and welcoming many into her home and heart. Services will be officiated by Walt Cooper of Proctor's Chapel Baptist Church.